Burnley manager Sean Dyche says the club do not need to sell any players during the transfer window. The Clarets moved out of the relegation zone after a four-game unbeaten run, which included Saturday's win over QPR. 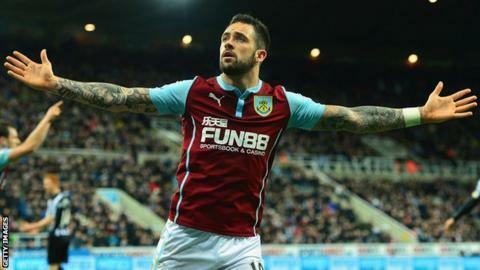 Six-goal Danny Ings, 22, who is out of contract this summer, has been linked with an £8m move to Tottenham. "We are quite secure. We are in a good position financially and looking to recruit... not let players go out of the building," Dyche said. "It is an ongoing situation with Danny but he will be a Burnley player - I'm sure of that because he's come out and said it. "The board have said it, the fans have said it, the bloke down the road said it to me this morning, the fella in the shop has said it and I've said it. So I'm pretty sure that will be the case." Club captain Jason Shackell is Burnley's only doubt for Wednesday's FA Cup third-round replay at Tottenham.